The early worm catches more fish and chance to win, so get in and start earning entries Monday, March 25. You’ll hook one entry for every 25 points earned. Saturdays in April – Earn 50 points and receive entries! Sundays in April, one winner will be selected every half-hour from 4pm – 9pm and win cash! At 9pm each Sunday one lucky winner will go home with $2,500! 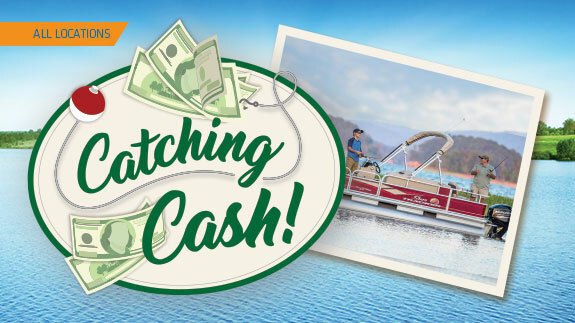 CHANCE TO WIN $1,000 CASH, PLUS A $20,000 SUN TRACKER BASS BUGGY FISHING PONTOON! Earn 15 points to play the “Swipe – A – Palooza” kiosk game to win between 5 – 500 bonus entries!